It’s hard to believe that it's only been two years since the merc with the mouth was given the big screen treatment he deserved. Now we have been given a proper look at the upcoming sequel. This is the second official trailer so far and had one purpose above all; to give us a glimpse at Josh Brolin as the time travelling Cable, who will also be seen earlier this year as uber-villain Thanos in Avengers: Infinity War. In true Deadpool style, the new trailer shows us some unfinished clips of Josh Brolin wearing a green sleeve with Deadpool’s annoyed voiceover declaring it isn’t finished. 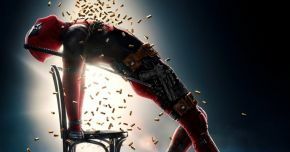 Ryan Reynolds and the marketing team did an incredible job of pushing the hilarious advertisements of the first film to levels never before seen outside of animated movies, with tons of footage of Deadpool trying to persuade the viewer to see his movie, as well as a brilliant Cancer awareness campaign. This sequel continues the fun by giving us more to be excited about. So far we’ve had Deadpool trying to stop a mugging but getting distracted by trying to get changed in a phone booth, then we had him becoming Bob Ross and painting continuity riddled artwork. Now we get a Toy Story styled sequence with Deadpool playing with action figures. There’s loads of new footage from the upcoming movie to whet out appetites until the release, including a truck chase, a quick glimpse of Domino, some shots of the returning cast including the scene stealing Blind Al and Negasonic Teenage Warhead, plus an incredible look at Cable in all his rendered glory in the future. Story details are still scarce and the official title hasn’t been confirmed, but from the looks of things, the sequel will be just as much fun as the first. Deadpool 2 will be released on May 18th.